This entry was posted on Sunday, August 27th, 2017 by Frances Ryan. One of the great things about my American holidays this year has been the reunions. Each of my three weekends has brought another group together, which means that I have been able to catch up with a lot of people with ease. The first weekend was a family reunion for my maternal grandfather’s side of the family. 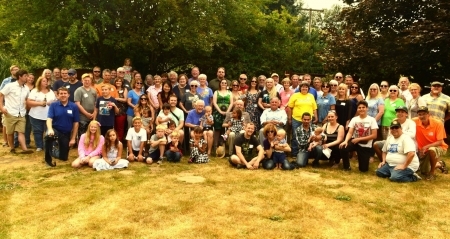 The “Eberle” reunion was planned to get all the cousins from my grandfather’s generation together, along with their offspring. My grandfather was the second youngest of the 14 Eberle children and all of his generation is gone now. But my mum’s generation made a great showing at the reunion along with all of the offspring and their offsprings’ offspring. The family reunion was my first time seeing some cousins since the last reunion I attended in 2011. And the first time since seeing my cousin Rita since her visit to Edinburgh in 2012. And the first time seeing other family since my last visit to America in 2014. So there were lots and lots of hugs that were long overdue! The next weekend was my best friend’s (Rachel) family reunion as well as my 25th high school reunion. My friend’s reunion was up at Lake Easton over the whole of the weekend. And as one of her sisters is another very good, very special friend (yes, Jennifer, you!!) and her other sisters (and various relations) are also friends, I was invited along for some of the fun. As Rachel’s son is my Godson and I haven’t seen her wee daughter since she was three months old, it was also a great opportunity to enjoy some kiddie time, too. I am, however, excited about the idea of my 30th class reunion. And I will certainly take a bolder stance in the planning department so ensure that it is actually well attended—or at least better attended by my friends. Or maybe I’ll just plan a wee 26th reunion specifically for my peeps on my next visit! In addition to the formal reunions that were happening each weekend, I was also able to reunite with various friends and family throughout the visit. Lunches, dinners, drinks, coffees… and lots of chatting and laughter. My Homeland holidays are nearly over now though so my reunions are now turning to farewells. But I hope to be celebrating reunions again before too long!